Below the plaques of 'THE TEN COMMANDMENTS' are two stone tablets, which were originally sited at the front of the former Frampton Church of England School, which was sold in 1997 and demolished in Spring 1998. The school closed in July 1968. A semi- circular stone bears the inscription: + RECEIVE INSTRUCTION THAT THOU MAYEST BE WISE + A.D. 1877. Another tablet is in the form of a Sundial and bears the words: 'HEAVEN FAVOURS THE DILIGENT' ERECTED 1818. 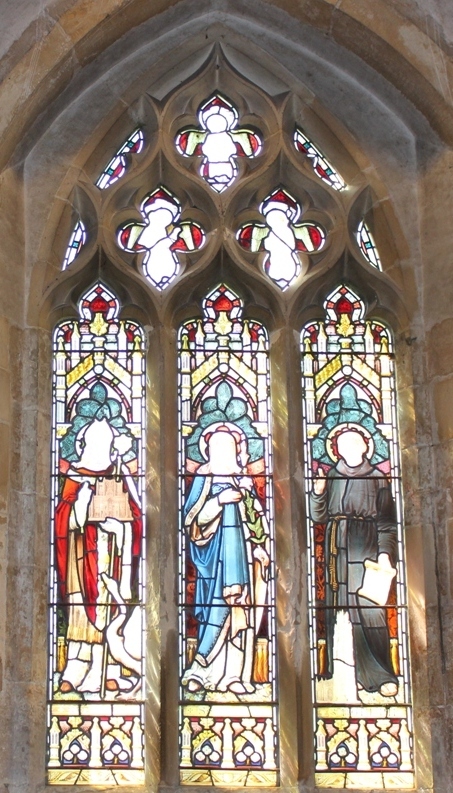 In the South Aisle, note the centre window depicting St. Mary, Patron Saint of this church; St. Hugh, Bishop of Lincoln, with his swan and holding a model of his Cathedral Church, and St. Botolph with a model of Boston Parish Church (The Stump) at his feet. By an old doorway arch, now occupied by the church heating panel, there is a fine oak medieval Vestry Chest, with hasps for three padlocks. This chest was cleaned and restored by members of Frampton W.I. as their contribution to the European Heritage Year. The fine Chandelier hanging in the nave holds 25 oil candles and is in regular use on festive and other important occasions. The quaint inscription on the boss proclaims it to be the gift of Coney Tunnard Gent in 1722. The rabbit surmounting the boss is no doubt a visual pun on the name Coney. The Tower houses a peal of six bells - the earliest dated 1602. The blocked elevated doorway in the south-west corner of the tower gave access to a ringing chamber floor at that level at some earlier period. The modern stone altar in the South Transept was erected in 1955, as a memorial to the Dennis family. Improvements to the facilities in St. Mary's were made in the latter part of the 20th century, with the addition of a gas fired warm air heating system, replacement carpeting for the Chancel and Nave, and a kitchen and toilet. The bell ropes were replaced in 1999. For many years the Font was housed in the south- east corner of the tower, until such time as it became necessary to move it to the south-west corner, to enable further strengthening of the tower support. In March 2000, the Font was moved from the south-west corner, to the Lady Chapel (south transept) and the stone altar was relocated to a more central position, to allow for the new Meeting Room in the south-west corner. This 'Millennium Project' was completed in September 2001 and dedicated by The Bishop of Grantham, The Rt. Revd. Dr. Alastair Redfern on 17th March 2002. In 2009 the church was re-wired and a new lighting scheme was installed. It was dedicated on 30th August 2009 by the Bishop of Lincoln, The Rt. Revd. Dr. John Saxbee. In November 2013, the church audio sound system and induction loop was updated. Church access ramps were replaced in 2018. In April 2016 a display cabinet was installed and dedicated to commemorate those killed in WW1. The Parish Council donated ceramic poppies purchased from the Tower of London 888,246 'Poppies in the Moat' display, which commemorated the centenary of the start of the Great War in 1914. Shell cases were also donated by individuals for the display. The poppies represent each soldier named on the Frampton War Memorial and Roll of Honour (above cabinet) who died between 1914 and 1918. Also in the cabinet is the 'Death Penny' and message from King George, presented to the family of Rifleman Ernest James Howell. Remarkably the framed plaque ended up in Illinois USA, before being presented to the church in 2009. It is thought that this earliest recorded church would have been wooden, and that it was soon replaced by a Norman stone-built church of which the preset Font Bowl and the hidden foundations which support the present pillars of the Nave are the only remains. The remainder of this 12th century church was pulled down about 1350 and the present church was built. This comprised the Nave, Aisles and South Transept, as remaining today. Major restoration work was carried out in 1889. The Church Organ was installed in 1909 and restored in 1981. Improvement work to the Pedal Bourdon and coupler action, was carried out in 2018. The Nave and Aisles were re-roofed in 1930 but in 2015, following a spate of lead thefts, part of the south roof and crossing was replaced with 'Tern Coated Steel'. At the same time, vestry and south porch tiles were replaced. It was a legal requirement that identifiable bat entry points were incorporated into the roofing material. 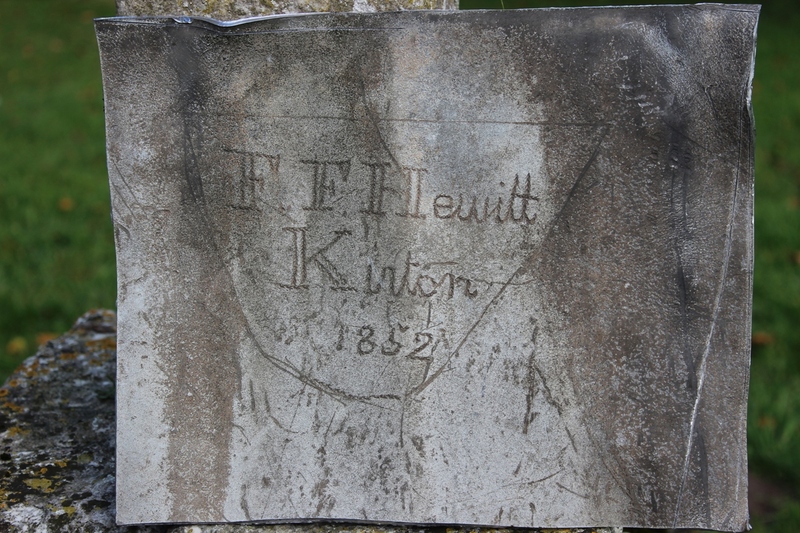 During work on this £95,000 roofing project, graffiti was discovered on a piece of lead above the Lady Chapel crossing: "FF Hewitt Kirton 1852" was inscribed in a half shield. Research revealed that the lead worker (plumber) was Francis Fisher Hewitt born at Kirton in 1831. Originally there was also a North Transept and a Rood Loft. Missing portions of the moulding and the high doorway in the Chancel arch show where the Rood Loft was accommodated. On the south side of the arch under the small window which houses the oldest stained glass in the church is an opening thought to have housed a Piscina, which would indicate the presence at some time of an altar on the rood loft. The Chancel of the 14th century church was no longer than at present. At some time between 1750 and 1850 the east end of the Chancel was demolished and one of the side windows used to provide the present east window. The stone carving around the doors and recesses in the Chancel is good, although suffering from ageing. It is interesting to note the measures taken in the south east corner to preserve one recess of the Sedilia with its carving. The recess on the north side of the Chancel is thought to have housed the tomb of the founder. During the same period the North Transept was demolished and the arches which spanned the east end of each aisle were removed because they were causing the pillars to lean. The Screen, said to be 15th century, is believed to be part of the screen which at one time divided the Nave from the transept crossing. Recesses in the Nave pillars show where this was fixed. The Pulpit is of oak and dates from the mid 17th century. It was purchased from Bourne Abbey for the sum of £3-3-0 (£3.15p) after a fire there and installed in its present position in 1891. Notches cut into the Nave Pillars are probably connected to the box pews which were removed in the 1890 restoration. At one time the then pulpit with reading desk was attached to the second pillar from the chancel on the north side. In the South Transept is a monumental effigy, much damaged and of unknown origin; it is thought from details of the costume to date from about 1300. `White's Lincolnshire' records that the lady is Johanna de Huntingford, a patron of the church in 1275, but this cannot be confirmed. Also in the South Transept can be seen the Mensa or stone top of a medieval altar, now set in the floor as the base of an altar table. The floor tiles in the Lady Chapel are of medieval origin. The Domesday Survey lists a Parish church and a priest in Frampton in 1086 AD. The vicar of Frampton in 1863, The Revd. John Tunnard, M.A., lived at Frampton House and was a considerable landowner. The condition of the roads from Frampton West to the parish church had long been the subject of adverse criticism and some years earlier, the vicar's father had found it necessary to take down the mound on which the former mill stood at Mill Hill. The materials were apparently used to fill up the holes in the road to Frampton House, as the vicar’s wife and daughters were so badly shaken up on their way to and from the church by carriage. For some years The Revd. Tunnard had been disturbed because many who were anxious to attend the parish church lived so far away from it. Some elderly residents had to travel three miles each way to church. He therefore determined to erect a church at the west end of the parish for their convenience. He chose as the site a grass field at the back of his residence, at first planning a simple building at a cost of £500. When this became known to his cousin, John Pearson, this gentleman subscribed £1,000 towards the cost of a new church... `which should be an ornament to the parish'. The church of St. Michael and All Angels was built of Ancaster stone in 1863 for The Revd. J. Tunnard. The architect was Mr James Fowler from Louth. The building consists of a nave, chancel and semi- octangular apse, with an organ chamber and vestry. It was apparently designed to accommodate 200 persons. On Monday, 27th April 1863, the corner stone was laid by Mrs Tunnard, at the north end buttress of the chancel. The project took six months to complete and the church was dedicated by The Right Revd. John Jackson, Bishop of Lincoln, on 19th November 1863. A new altar to replace the original wooden table was consecrated by the Bishop of Lincoln, the Right Revd. Kenneth Riches on the 9th May, 1958. A vestry screen was added, in memory of a member of the congregation who died in 1999. A stained glass memorial window was installed in 2008, reflecting the location in a rural community. On 24th November 2013, a special service was held to commemorate the 150th anniversary of the church. Below: Spire Belfry in rows - North, South, East, West. 1st, 2nd, 3rd, 4th level left to right. Touch or click to view enlarged image. Grotesques above Level 1 Belfry Lights pdf download document to see more. Frampton Pageant remembered by Joan Biggadyke 1994. St Michael & All Angels For some years The Revd. Tunnard had been disturbed because many who were anxious to attend the parish church lived so far away from it. Some elderly residents had to travel three miles each way to church. He therefore determined to erect a church at the west end of the parish for their convenience. He chose as the site a grass field at the back of his residence, at first planning a simple building at a cost of £500. When this became known to his cousin, John Pearson, this gentleman subscribed £1,000 towards the cost of a new church... `which should be an ornament to the parish'. On Monday, 27th April 1863, the corner stone was laid by Mrs Tunnard, at the north end buttress of the chancel. The project took six months to complete and the church was dedicated by The Right Revd. John Jackson, Bishop of Lincoln, on 19th November 1863. A new altar to replace the original wooden table was consecrated by the Bishop of Lincoln, the Right Revd. Kenneth Riches on the 9th May, 1958. A vestry screen was added, in memory of a member of the congregation who died in 1999. A stained glass memorial window was installed in 2008, reflecting the location in a rural community. On 24th November 2013, a special service was held to commemorate the 150th anniversary of the church. St Michael's and St Mary's churches are both kept in good repair with the support of the congregation and local community, including fundraising events organised by Friends of Frampton Churches.